These showy pieces really make an impression! Some of the drusy stock would not be workable without intensive stabilization, and those are listed on our mineral specimens page. Production at this mine is sporadic, but I was fortunate enough to be able to cherry-pick some of the best pieces as they came in from the mine. These are priced according to quality and total drusy area. This gorgeous specimen has an archipelago of botyroidal malachite clusters scattered across a sea of rich robins-egg blue chrysocolla, all covered by water-clear quartz druse. There is also patch of drusy chrysocolla and malachite on the oposite side of this piece, about .75" x .75" in area. This is very high-grade material, with lots of drusy surfaces. Overall dimensions 2.25" x 1.25" x 1.25". This beautiful bed of drusy malachite sits atop a layer of crysocolla, and the layering of colors and textures will make for some aesthetic cabs. 1.75" x 1.5" x 1" overall. 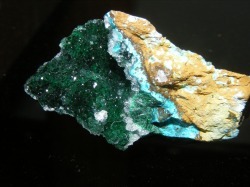 Locality: Lily Mine, Pisco, Ica, Peru. A nice piece with lots of clear, sparkling druse over rich chrysocolla and dark green tufts of malachite. Top quality material. Some damage to quartz druse is apparent in the photo. Overall dimensions are 2.25" x 1.5" x 0.75"